A talk about Mahatma Gandhi » Ambassador Fabian’s blog, KP Fabian, Analyst - international political developments, global issues, Indian national issues. Mahatma Gandhi Society of Ottawa, 1984. Speech during the symposium held on Monday January 30, 1984 at St. Paul University, Ottawa. It is singularly appropriate that a symposium on Mahatma Gandhi should take place within the precincts of St. Paul University. Gandhi applied the Sermon on the Mount in a large socio-political setting; perhaps the largest in history as far as application of the Sermon is concerned. The Church departed from the Sermon on the Mount fairly soon after she was accepted by the Roman establishment, and, subsequently, propounded the Doctrine of Just War. Every age has its share of dominant ideas, for good or evil. I shall mention only two of the dominant ideas of our age: first, nationalism, our golden calf. All calves are sovereign and equal, even if it happens that at times the bigger ones eat up smaller ones. The second dominant idea is the divine right theory of super powers. We have outgrown the divine right theory of kings. But the establishment in North America, Western Europe and Eastern Europe (including the Soviet Union, Australia, New Zealand, Japan etc.) believes in this theory. The Super Powers, according to this theory, are entitled to pursue the arms race even though the very survival of the human race is gravely endangered. You and I need passport and visa to cross national frontiers. But not so, the inter-continental missiles. The state, is only a technical tool, and not an entity of inherent worth. Gandhi’s idea of the state would roughly correspond to that of Max Weber. For Gandhi, the state is subject to the moral law. Gandhi has spoken on the international issues of his time such as the persecution of Jews in Nazi Germany, invasion of Abyssinia by Italy, that of China by Japan, and that of Czechoslovakia by Hitler. 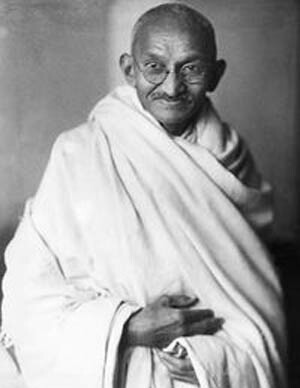 Gandhi said, for example, the Jews in Germany should have resorted to active non-violence. When it was pointed out to him that what could non-violence do against aerial bombing of China by Japan, Gandhi said that behind the bomb was the man who pushed the button and active non-violence should be able to make an impact on him. Gandhi was invited, many a time, to Western Europe and to the United States. Responding to one such invitation from the blacks in United States, Gandhi said that he should first complete his task in India, before embarking on saving the world; he was still an imperfect tool of non-violence. On a more philosophical plane, Gandhi was fond of quoting Cardinal Newman “one step enough for me.” As regards the national freedom struggle, Gandhi felt that he was in command and, therefore, laid down the law of non-violence, even when he knew that for the Congress it was only a means, and not an article of faith. When Pandit Nehru’s government decided to send troops to Kashmir to defend Kashmir from invaders from Pakistan, Gandhi did not disagree with the decision. Stand ye calm and resolute,Like a forest close and mute,With folded arms and looks which areWeapons of unvanquished war. And if then the tyrants dare,Let them ride among you there,Slash, and stab, and maim, and hew -What they like, that let them do. With folded arms and steady eyes, And little fear, and less surprise, Look upon them as they slay, Till their rage has died away. Then they will return with shame To the place from which they came, And the blood thus shed will speak In hot blushes on their cheek. Rise like lions after slumberIn unvanquishable number -Shake your chains to earth, like dewWhich in sleep has fallen on you -Ye are many, they are few. I am told that these lines are not all that well-known. Could you tell me why? Indian’s will always miss his leadership. We need great leaders like him to prosper.